Brett Brown is still in charge of the Sixers. It was midsummer, and the offices were quiet. Too quiet. It was too quiet in Camden for the Sixers to be pursuing a realistic replacement for former general manager Bryan Colangelo, who resigned in disgrace in June after Burnergate. The team reportedly approached a handful of star GMs who were already under contract with contenders, but that was largely seen as a ruse. They couldn't have been serious. All around the league, and all through the team's practice facility, there simply was no buzz. 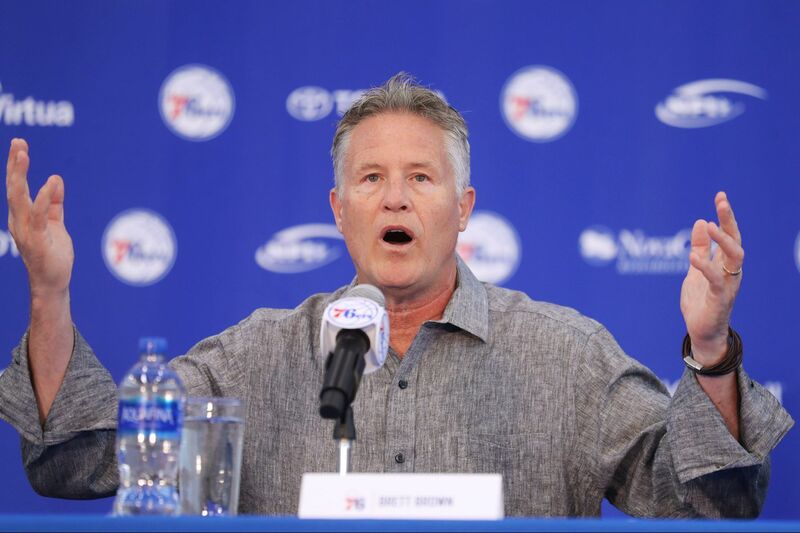 It was obvious: Head coach Brett Brown, freshly signed through 2021-22, had ascended to power. Having served for five years under two very flawed general managers, he was never going to give it up. Monday, the team announced it will enter its most important season since 2000 without a traditional GM. The Sixers' absentee owner, Josh Harris, needs someone he can trust to shepherd the NBA team he so often ignores in favor of his NHL toy, the New Jersey Devils, and the soccer team that gives him international panache, Crystal Palace of the English Premier League. Harris adores Brown, so things have settled as they should. Harris on Monday told ESPN.com that Brown would remain the "interim" GM, and that the Sixers will continue to examine unspecific "elite" GM talent because they believe their GM spot is worthy only of the best of the best. That, too, is lip service. Brown now has complete control of a franchise whose three most significant players, Joel Embiid, Ben Simmons, and Markelle Fultz, promise to be mini-corporations, brand names of the game, and power brokers of the highest degree, in the vein of Kobe, LeBron, and Jordan. It is best to have them all hear one voice, to answer to one boss. Brown is the rare sort of coach who possesses the character and the wisdom to be that voice. Brown will not rule without the help of lieutenants. He will continue to collaborate with Colangelo's chief of staff, his assistant GM, his analytics director, and the team's minor-league GM. All were internal candidates, and the team Monday announced "promotions" for all of them to more significant positions, with greater responsibilities. None of those positions included "general manager." None of those responsibilities included "final say." Ned Cohen, who left the NBA offices to join the team in an oversight role as it reorganized itself in 2016, becomes the money man. According to the team's press release, Cohen "will oversee all facets of roster and salary cap management," and implies that he will oversee other relevant expenditures, too. However, there is no mention of Cohen's leading, say, contract negotiations. Marc Eversley effectively was Colangelo's assistant GM, though his title was vice president of player personnel. Now, he's the senior VP of player personnel. Which means he's still the top talent scout, only without the hindrance of Colangelo. Elton Brand, the GM of the G League affiliate Delaware Blue Coats, now gets a louder voice. Watch Brand over the next year or so. He's going to be a GM in the NBA sooner than later. From left, Ned Cohen, Brett Brown and Alex Rucker watching prospects during a pre-draft workout in June. Keep an eye on Alex Rucker, too. Like Eversley, Rucker added senior to his title, which was vice president of analytics and strategy. The Sixers rode Rucker's voluminous, detailed reports to the No. 3 seed and the second round of the playoffs last season, and that earned him a 22 percent increase in staff this offseason. His might sound like an ancillary wing, but Rucker's department already is 35 percent larger than the scouting department, and he and at least two of his staff interact with Brown and his staff every single day. Brown oversaw these promotions, as well as the other offseason chores — chiefly, expanding the analytics and sports science departments and coordinating the offseason development programs crucial for the development of young cornerstones Embiid, Simmons, and Fultz. As good as this news is, not all of Philadelphia will rejoice that Brown has become the Gregg Popovich of the I-95 corridor. The team won 52 games, 24 more than the previous season. Embiid became an all-star starter. Simmons won rookie of the year, for whatever that award is worth. But Brown wasn't perfect, and he didn't care about being popular. He made missteps as a rookie head coach in the playoffs against Boston. He gave his unwavering endorsement of Fultz after Fultz's lost rookie season, which was amplified by the pre-draft trade the Sixers made to assure they would get him, and the transcendent playoff performance by Celtics rookie Jayson Tatum. Brown failed to land free agents LeBron James, who didn't even bother to meet with the Sixers before he signed with the Lakers, and Paul George, who stayed in Oklahoma City. Brown also failed to trade for his former Spurs pupil, Kawhi Leonard, who landed in Toronto. Finally, Brown oversaw the drafting and immediate trade of Villanova star Mikal Bridges. Yes, it's good to be king. But it's never, ever easy.